Perhaps the most famous passage in the book of Ezekiel (high praise, right?!) comes in chapter 37 when God takes his prophet into a valley full of dry bones. After 30-plus chapters of prophesying judgment on idolatrous, exiled Israel, God uses the lifeless bones as a picture of the nation of Israel—“dried up,” “without hope,” “cut off” (37:11). Into this hopeless scene, where God’s people appear doomed to certain death, God promises to bring life. In one of the most vivid Old Testament images of resurrection life, God breathes life into the dry bones and sees them become a multitude, “an exceedingly great army,” of living people. God tells Ezekiel that this represents his promise for hopeless Israel – that he will open their graves and raise them from death to new life, that his Spirit will bring revival to his people in the midst of their failure. Right now we are in a season of the church calendar where we look forward to the celebration of Easter and the resurrection of our Savior. But before the joy of Jesus’ resurrection came the shame of betrayal and the suffering of the cross. Before we get to celebrate Easter, we first mourn our sins and betrayal that drove Jesus to the cross. And the more deeply we are aware of the brokenness and death Jesus came to deliver us from, the more deeply we will long for the glory of the new life and hope that Easter brings. In much the same vein, there’s something about the dreary darkness of a cold, wet winter day that makes you long for spring and the new life it brings. It happens that way every year, doesn’t it? It’s a truth of God’s character he has built into creation as well as into his relationship with his people—winter gives way to spring, a death always precedes a resurrection, brokenness comes before renewal. Why does brokenness tend to come before renewal? There are many answers to that question, but the simplest one is this: Renewal comes from God, and brokenness drives us to Him. From the Old Testament people of God through Pentecost and into the New Testament church, renewal and revival is a work of God’s Holy Spirit. He is the one who brings healing and forgiveness to the land in response to the prayers of God’s people (II Chronicles 7:14). He is the one who sweeps through crowds of people like fire (Acts 2). He is the one who brings life to dead people (Ephesians 2). And what drives us to cry out to God more than our brokenness? It is an awareness of our weakness and need that drives us back to God, the source of our renewal. We find that when we are weak, then we are strong because his power is made perfect in our weakness (II Corinthians 12:9-10). Lest we forget, the point of the gospel and the purpose of our lives is that God’s power and glory be made much of, not that our power and glory be highlighted. Theologians have long emphasized the importance of seeing our need so that we would run to Jesus, as Roy Hession explains in We Would See Jesus: “The Lord Jesus is always seen through the eye of need. … The acknowledgment of need and the confession of sin, therefore, is always the first step in seeing Jesus. Then, where there is acknowledged need, the Holy Spirit delights to show to the heart the Lord Jesus as the supply of just that need.” Our brokenness drives us to Jesus, and He brings the renewal we need. How should this shape a church? There are many implications of this reality in our individual lives, but the Valley of Dry Bones is about a corporate reality for God’s people. What does it teach us about being the people (church) God intends for us to be? For us as a church corporately, this reality is a reminder that God alone brings revival and that He brings revival to communities that are driven to their knees (or to the point of all their bones falling apart!) in humility and cry out to Him. Have you ever wanted to be a part of a church that could be accurately described as a hopeless, lifeless pile of dry bones? Probably not, but do we try to fashion our church as a successful church or a needy church? A proud church or a humble church? A capable church or a praying church? We have to beware of trying to experience the resurrection life God has called us to live as his people without dying first – without first and continually dying to our own capabilities, our own wisdom, and our own glory. Do we spend more time trying to arrange people and details to make a service, ministry, or program come off just right or pleading with God for his Spirit to breathe life into dead hearts and make his power evident in our weakness? Just like the image of the Valley of Dry Bones in Ezekiel 37, God delights to find his people despairing of themselves and pleading for Him to show up and bring revival. Perhaps even more pointedly in light of the recent corporate confession from our Session, are we more embarrassed by past failures or grateful for repentant leaders? Do we get more discouraged by our weaknesses or more encouraged by God’s strength? I praise God that He has continued to breathe life into our seemingly dead bones, and I pray that we would increasingly be a church that displays the life-giving power of God even and especially in our weakness. Some days I feel what Ezekiel must have felt at the beginning of chapter 37 as he stared at the dry bones and thought of God’s people. The individual and corporate brokenness at Southwood breaks my heart, and I grieve the struggles experienced in the pastor’s office and the pews. Those are also some of the times where I get most excited about what God is doing in our midst. I can’t escape the fact that He loves us – is crazy about us! – in spite of ourselves! I can’t escape the biblical reality that it’s when we seem most dead that he tends to bring most true life. What might God do if we embraced our weakness and looked eagerly for his strength? If he breathed life into dead bones, what might he do at Southwood? What if broken people in a broken church found renewal in their hearts and revival in their congregation? What would be the result beyond the doors of their homes and churches? The beautiful thing that begins to happen when God brings this renewal and revival is that broken people move toward brokenness to offer hope! Because we are aware of our own weaknesses and dependency, we want to introduce fellow sinners to the Great Physician, in whom the broken and hurting find refuge and a home. Think of all the broken lives, families, and relationships you know just in your own circle of friends and acquaintances. Think of all the broken systems, schools, and neighborhoods in our community. As God brings renewal to our hearts and revival to our church, the result will inevitably be our moving into the brokenness of others. Having received healing from Him, nothing could stop us from shining his light into darkness around us and offering his hope to others also facing despair. Thus, God’s cycle of brokenness leading to renewal starts all over again. 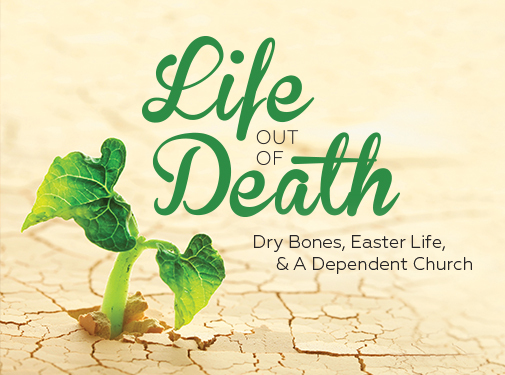 Dry bones leave an Easter service (or any other Sunday) and know where to look for resurrection life for themselves and where to point other dying people in need of the same.